If you are tired of performing the tedious – and potentially dangerous – task of manual gutter cleaning, consider investing in a leaf guard from GutterDome. 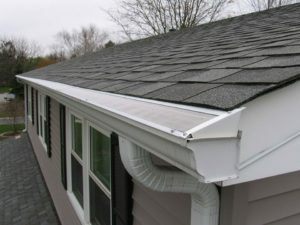 Our products deter all kinds of debris – including leaves, seed pods, roof grit, insects, and pine needles – from entering your gutters thanks to surgical grade stainless steel mesh, preventing the need to perform annual gutter cleaning and allowing you to relax knowing that your gutters will be free from clogs year-round. GutterDome Adjustable – This leaf guard was designed to be installed on homes where the guard cannot tuck under the roofing material, as it is compatible with the Clynch Channel™ fastening system. GutterDome Magma – This leaf guard is ideal for homeowners who live in climates where ice and snow are frequent, as it can be equipped with an integrated heat cable to melt ice and snow. No matter which leaf guard you choose for your home, you can relax knowing it will boast unparalleled strength and durability, since all of our products are made with 6063 extruded aluminum and coated with a clear anodizing finish to deter corrosion. You can also feel good knowing your purchase is secure, since all of our products are backed by an incredible 30-Year Lifetime Material Warranty – which is the longest standing gutter guard warranty available today. If you are interested in purchasing a GutterDome leaf guard to protect the gutters on your home, contact us today. We will be glad to answer any questions you may have, as well as help you find a GutterDome Authorized Dealer in your area to handle the installation for you.